The Piney-Z Community Development District (CDD) was created in June 1997. The establishing entities are the legislative and executive branches of the State of Florida, and the City Commission of the City of Tallahassee. Initially this local unit of special-purpose government was created to provide urban community development services, focusing on the laying-in of basic infrastructure, including but not limited to roads, sewers/water, landscaping within rights of way, etc. 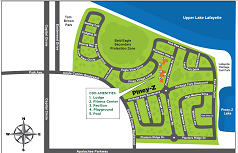 Subsequently, the Piney-Z CDD Board of Supervisors elected to purchase approximately 4.52 acres, sited near the center of the development, to create recreation and meeting facilities for residents of the community. The primary statutes under which the district operates are Chapter 190, Florida Statutes, Community Development Districts, and Chapter 189, Florida Statutes, Uniform Special Districts Accountability Act. In addition to maintenance of the common areas and the long term management and oversight of the community created, including the amenities, the district’s board is also responsible for establishing an annual budget necessary to operate the recreational and meeting amenities, and to assess each landowner his/her fair portion of the total required, based on lot size. The assessments are collected annually for the district by the Leon County Tax Collector, for which the collector is paid a percentage of the total collected. Because the CDD is a not-for-profit entity, landowners in the CDD receive the benefit of the district’s authority to pay no sales tax on goods and services, and to secure requisite financing via tax-exempt bonds issued at reduced interest rates. Finally, the district establishes and enforces rules by which the common areas within its purview as well as the amenities are operated and maintained. In addition to local staff, the Piney-Z Community Development District employs a District Manager whose firm (INFRAMARK) is certified to manage the assessments collection as well as other matters required by Florida law. Robert Koncar, General Manager of INFRAMARK, serves as the non-voting Treasurer of the Piney-Z Board of Supervisors. Bob Nanni, also of INFRAMARK, serves as our District Manager; he may be reached at 813-991-1116, ext. 105, or at Bob.Nanni@inframark.com. Original debt incurred to lay in the infrastructure. Each lot is tied to a portion of the debt, which will be retired in 2019. As referenced earlier, this debt may be paid in full at any time prior to 2019; if you would like detailed information concerning pay-off, please contact Luvinia LaCap at 954-603-0033, ext. 40534. She may also be reached at luvinia.lacap@inframark.com. If you do not want your email address released in response to a public records request, do not send electronic mail to this entity; instead, contact this office by phone or in writing. Debt was incurred for purchase of the Swimming Pool, Lodge, Fitness Center, Pavilion and parking lot, as well as for purchase of the Playground equipment. This debt may also be paid in full prior to 2019. It is important to note that, while the bond debt for the amenities will be retired in 2019, a significantly reduced assessment will continue to appear on your tax bill from Leon County to cover the operating and maintenance expenses thereof. Who runs the district government? The Piney-Z district government is run by a board of supervisors elected by the landowners. In 1997, when the district was created, the board was controlled by the developer. As homes and lots were sold, the process evolved so that supervisors were elected by the registered voters who purchased property in the district. This process is described in Chapter 190, Florida Statutes, the state law which provides for the creation of community development districts. Because community development districts are governments, no one really owns them. They are created by ordinance and designed to exist for the benefit of current and future residents.